You need a business plan for the start-up or expansion of a nonprofit for the same reasons you do for a for-profit enterprise. It’s often said that nonprofits should be run like for-profit businesses. Additionally, you need to make the case for your mission, explain why donors and grantors should provide funding, and seek a qualified board of directors (sometimes called a board of trustees). In fact, since a nonprofit business plan contains more information about mission and vision, it is commonly referred to as a strategic plan. Do you have a “pure” nonprofit or one that is a mix of for-profit and nonprofit activities? If you have a mix, then you probably need two business plans: one for each part of the business. AARP, for example, has both a for-profit business where it sells insurance and products and a nonprofit business to advocate for people over 50. In a nonprofit business plan, the marketing section is expanded to a marketing and development section. Marketing addresses the nonprofit’s target market, and all the analysis of identifying and reaching out to these customers applies equally to for-profits and nonprofits. Nonprofits also have a second set of customers — those individuals or entities who will be making contributions or volunteering their time and/or services. Nonprofits usually call this fund-raising and friend-raising development. In your strategic plan, you should include a subsection under marketing and development addressing how you will achieve funding levels to support your efforts to carry out your mission. When creating the marketing and development section, be mindful of the metrics used to describe activities and success. Unlike most for-profit companies where success is measured in monetary terms, in a nonprofit, success is achieved if you have sufficient financial resources to carry out your mission and the mission’s objectives are accomplished. Most nonprofits collect data about the “inputs” — how many resources like staffing, purchases, machines, and a number of offices were used to achieve the objectives. They also collect information about the “outputs” — how many items were made and sold, reports prepared, patients seen, speeches given, and so forth. But what warms the hearts and minds of potential donors are the “outcomes.” If the nonprofit is a medical clinic, examples of outcomes would be how many lives were saved, how many families were kept intact, and how many days were not lost at work. Inputs and outputs are usually gathered from the organization’s accounting system or other readily collected data. Outcomes usually belong to the customer — the people or organizations the nonprofit is helping — and are often only available by survey. 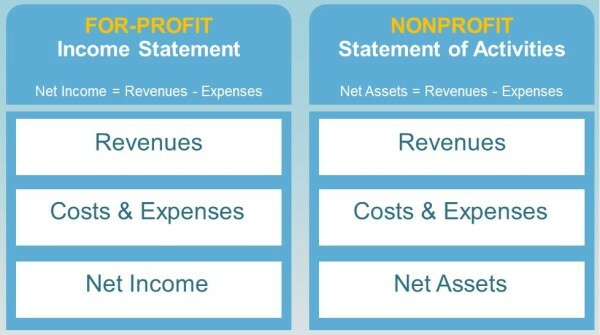 The key difference between for-profits and nonprofits is in the layout and names of the financial statements. There are several nuances in accounting rules between for-profit and nonprofits, which your accountant can help you with. Be sure to use an accountant with nonprofit experience and other nonprofit clients. First, what we refer to as the for-profit balance sheet becomes the nonprofit statement of financial position. Since a nonprofit has no stockholders or investors, the stockholders’ equity section becomes the net assets section. The net assets section has three components capturing the nature of any donations classified as “unrestricted” (nonprofit can use funds for any purpose) “temporarily restricted” (funds are for a specific project, activity or time period) or “permanently restricted” (donated funds cannot be utilized by the nonprofit). Second, since the purpose of a nonprofit is a mission and not income, the for-profit income statement becomes the nonprofit statement of activities, and its bottom line is net assets rather than net profit or net income. A nonprofit needs a business plan for the same reasons a for-profit business does. A nonprofit business plan is often called a strategic plan since it is largely focused on mission and vision. 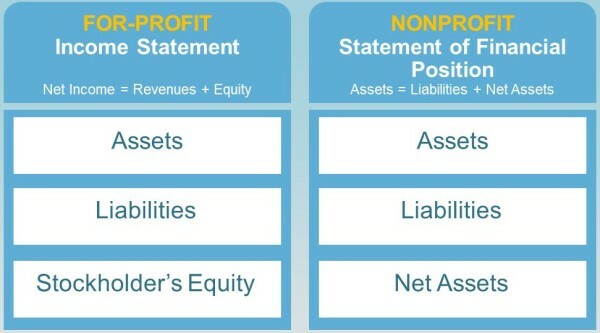 While there are similarities between for-profit and nonprofit financial statements, there are important differences. Create your marketing and development section focusing on your two sets of customers. Develop your financial statements recognizing the similarities and differences in comparison to traditional for-profit financial statements. This article was written by Hal Shelton from Business2Community and was legally licensed through the NewsCred publisher network. Please direct all licensing questions to legal@newscred.com.